Waiting for Dr. Newman: The English cardinal belongs among the church's greatest teachers. What lay behind his denial? First, he supposed that in order to merit the description, the theologian must be an expert with complete command of one particular field, whereas he knew himself to be a wide-ranging amateur with many interests. Second, in contrast with his leadership of the Oxford Movement while an Anglican, as a Catholic Newman resisted all suggestions that as a writer he should exercise some public or official function. The third reason for his denial is the most important and, to my mind, the most interesting. On becoming a Catholic, Newman found theology, as practiced in the Roman schools, to be rigorously abstract, ahistorical and deductivist. Baroque neoscholasticism, as he encountered it, was alien to his whole mentality. If this was theology, then he preferred to describe himself as a controversialist. Times have changed and, thanks to the pioneering work of ressourcement undertaken by the great historical theologians of the early and mid-20th century, Catholic theology has by and large escaped from the aridities of neoscholasticism and has re-established contact with the biblical and literary richness of patristic and medieval Christianity. We may find Newman’s grounds for denying that he was a theologian good reason for appreciating his theological strengths. The interrogative, tentative, inductive temper of his arguments and his lack of specialization are more likely today than they were in the 19th century to be appreciated as virtues in a theologian. There is still, it is true, some way to go in sufficiently extending the range of our criteria for good theology. Newman, the consummate preacher, was a master prose stylist. We are still somewhat one-sided in our appreciation of the transcendentals. I dream of the day when the beauty of a piece of theological writing is deemed no less important than its accuracy, for how could one speak well of God in ugly prose? Cardinal Newman is dead, and we lose in him not only one of the very greatest masters of English style, not only a man of singular beauty and purity of character, not only an eminent example of personal sanctity, but the founder, we may almost say, of the Church of England as we see it. What the Church of England would have become without the Tractarian movement we can faintly guess, and of the Tractarian movement Newman was the living soul and the inspiring genius. Great as his services have been to the communion in which he died, they are as nothing by the side of those he rendered to the communion in which the most eventful years of his life were spent.… He will be mourned by many in the Roman Church, but their sorrow will be less than ours, because they have not the same paramount reason to be grateful to him. Today, more than 100 years later, we can return Dean Church’s compliment. Much that we most admire in Newman, much that makes him seem prophetic of the things that the Catholic Church sought to recover and achieve at the Second Vatican Council, are gifts he brought us from the Church of England—from Tractarian Oxford. At the Second Vatican Council the tides of clericalism, over-centralisation, creeping infallibility, narrow unhistorical theology and exaggerated mariology were thrown back, while the things Newman stood for were brought forward—freedom, the supremacy of conscience, the Church as a communion, the return to Scripture and the fathers, the rightful place of the laity, work for unity, and all the efforts to meet the needs of the age, and for the Church to take its place in the modern world. Any disarray or confusion there may now be in the Church is the measure of how necessary this renewal was. On April 28, 1990, Cardinal Joseph Ratzinger gave an address on the occasion of the centenary of Newman’s death. It is, he said, characteristic of a great doctor of the church that he teaches not only through his thought and speech but also by his life, because in him life and thought permeate and shape each other. If this is so, the cardinal concluded, then Newman belongs to the great doctors of the church, because he both touches our hearts and enlightens our thinking. But we are not there yet. There is poignancy in the thought that neither Christopher Butler nor Stephen Dessain seems to have noticed that tides never flow in the same direction for very long. The Curial resistance to renewal has not been broken and has been at the heart of the concerted attempt in recent years to argue that nothing of any great importance happened to the Catholic Church between 1962 and 1965. 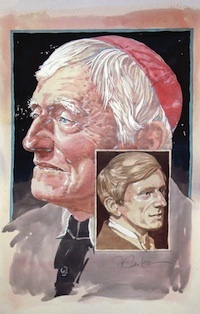 At the heart of my hope that, with beatification swiftly followed by canonization, Newman may before too long be officially declared a doctor of the church, is the belief that such a declaration would be a powerful signal that the church has not abdicated its dedication to the movement of renewal and reform that the council so wholeheartedly initiated. * The Letters and Diaries of John Henry Newman, Vol. 28, C. S.
Dessain and T. Gornall, eds. (Oxford, 1975), p. 216. Coulson and A. M. Allchin, eds. (London, 1967), p. vii. I thoroughly enjoyed this article on Cardinal Newman. I am motivated to become more familiar with him. Perhaps, for those who are less informed, and there are many of us, some of whom probably read America I think it would be helpful to sometimes add a Side Bar to an article to explain less known references, e.g. the Tractarian Movement. This article also appeared in print, under the headline "Waiting for Dr. Newman," in the February 1, 2010 issue. Nicholas Lash is the Norris-Hulse Professor Emeritus of Divinity at the University of Cambridge and the author of many books and articles.